Councillors at the July council meeting. HERITAGE, planning matters and public questions occupied much of the time at the monthly meeting of the Derwent Valley Council on July 19. The public open session started just after 6pm with deputy mayor Ben Shaw in the chair due to the late arrival of the mayor. Cr Shaw remarked on the full public gallery despite there having been two council meetings in quick succession, with the budget being handed down at a special meeting last week. Issues raised during the open session included a bouquet for Cr Shaw and the members of the public who helped the Tidy Towns Committee collect 92 bags of rubbish during a working bee in the upper reaches of Kensington St, which has been plagued by illegal dumping. The bouquet was followed by a brickbat for the council's delay in tabling minutes of the Tidy Towns Committee. Mayor Evans arrived at about 6.05pm, having attended the opening of extensions to Williams' Outdoors in High St. He remarked that the High St shop now had the largest range of fishing lures and firearms in the state. The council was also asked when a hard copy of the new budget would be available and a follow-up question queried a change made to the budget without being made available to the public at the budget meeting. Further questions dealt with two matters before the council that night: the proposed demolition of a heritage-listed house on the Derwent Esplanade and the recommendation to permit the Friends of Willow Court to offer monthly tours. The formal meeting got under way at 6.30pm with all councillors in attendance. Minutes of the previous month's meeting were approved and declarations of interest were declared by Cr Salt and Cr Evans in relation to several items in the agenda. General manager Greg Winton declared an interest in an item in the closed agenda. Public question time started with Mr Len Butterworth taking issue with statements attributed to the council in a recent article in the Mercury about the former Royal Derwent Hospital site. 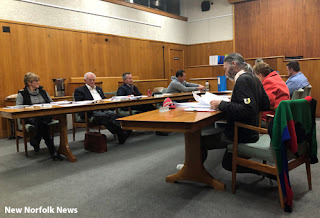 Mr Winton responded that the article in question - relating to the Willow Court heritage listing decision - was not based on a council media release A question was received from Mr Andrew Lawson about the quarry on Collins Cap Rd, in particular whether a permit had been issued for the buildings on the site. The mayor took the question on notice. Mr Alby Stephenson asked about the $200,000 budget allocation for roadworks on Collins Cap Rd and whether further additional funds had been added. Cr Evans said there had not been a further contribution and $60,000 of the $200,000 would be spent this year on investigative works and costings for the Collins Cap Rd upgrade. A question in writing was received from Mrs Di Cowburn, asking why the significant amount of $60,000 had been removed from the Collins Cap Rd allocation. Cr Evans said the expenditure would provided a proper design and accurate costings for future works on the road. In a second question, Mrs Cowburn asked why the privately-operated High St market was now to be funded by the council. She said costs associated with the market should be covered by stall site fees and asked whether that money went to the council. Cr Evans said part of the recent budget allocation was to install bollards in the market area. Mr Winton said there was also an allocation in the budget for pickup and removal of traffic management signage associated with the market as well as a contingency in the event that there are no responses to the council's call for expressions of interest in running the market and the council decided to employ someone to conduct the market on its behalf. Mr Chris Lester asked why the council's waste management levy had been increased when it had since been revealed that the situation at the New Norfolk tip site was no longer urgent, with news of a 10-year extension for the facility. He asked whether the 10-year extension was based on the tip site being used by Derwent Valley Council ratepayers only, and why had the council not removed the $85 levy if the future life of the tip was 10 years instead of only two. Cr Evans said the half-million dollar difference between the cost of waste management and the income received was one of the gaps that had been identified in the council budget. "These increases are us being financially responsible," he said, "to make sure that we do have a waste transfer station some time in the future and ... also to remediate that site." After 11 minutes of public questions the council moved into Planning Authority mode to deal with two development applications. Councillors spent 10 minutes discussing an application to approve the demolition of a heritage-listed house and tree on the Derwent Esplanade and the construction of a new sport and recreation centre by the New Norfolk Rowing Club. The application was approved unanimously. Cr Pearce foreshadowed a further motion to offer the house for removal rather than demolition. Discussion of the next development application lasted 25 minutes following a motion by Cr Shaw to overturn the planning officer's recommendation and approve - rather than reject - the proposal to allow a former petrol station to be used as a mechanic's workshop. Planning officer Patrick Carroll said the proposed use was not permitted under the council's interim planning scheme but would be likely to be allowable under the future statewide planning scheme when it comes into force. Councillors voted 7-1 to approve the application. In other business, the council received minutes of meetings from the New Norfolk Historical Information Centre Committee, Boyer Oval Management Committee, Derwent Valley Youth Future Action Team, Friends of Frescati, the Tynwald Park Development Committee, and the New Norfolk Swimming Pool. The council then considered its position on the various motions and recommendations going to the annual general meeting and next general meeting of the Local Government Association of Tasmania. The mayor then declared an interest and left the chamber while the council considered its quarterly report to the Director of Local Government following the confidential inquiry into the council last year. One of the ongoing matters has been the issue of a GST credit relating to the council paying for repairs to the mayor's car and then providing a loan in order to recover the amount. The June 2018 advise to local government director Alex Tay was that the GST credit had been considered by the council's audit panel and "alterations to the amount payable and Australian Tax Office returns has been implemented." Discussion of this report was minimal but had a sequel later in the meeting when Cr James Graham asked how often the director had responded to the quarterly reports. The council also approved a calendar of events proposed by the Friends of Willow Court Special Committee, including permission to run tours and operate a website and Facebook page. Cr Salt sat through the brief discussion of the proposal, which she had lodged on behalf of the committee. "It is well-known in the community that I am a member of the Friends of Willow Court committee and I do have an interest in the matter to be discussed but I do not believe that I have a pecuniary interest and I intend to remain in the room to participate in the discussion to determine the matter," Cr Salt said. The council then unanimously to call for expressions of interest in order to find an operator for the New Norfolk Market in High St. The council's regional development officer said 296 responses had been received to a council survey on the market, with the overwhelming majority showing support for its continuation. The council will offer a 12-month licence to operate the market, with performance reviews every two months. Next up was the general manager's senior management report, which was of more interest than usual as it contained the news that the Federal Government had rejected the application for national heritage listing for Willow Court. Cr Anne Salt said she wanted to know who had written the application; what qualifications and experience did they have in writing applications for national heritage listing; what community consultation took place in the development of the application; and when will the application and report be made public. The general manager took the question on notice, saying the application had been submitted before his time. He said he had asked the Australian Heritage Council to publish the decision on its website. Regional development officer Jess Dallas said the nomination had been prepared by a consultant appointed and paid by the council, and to the best of her knowledge there was no public consultation and no staff input. Cr Salt followed-up with further questions later in the meeting. As the open part of the meeting drew to a close, the mayor called for councillors' questions without notice. Having foreshadowed it earlier, Cr Pearce moved: "That council urgently explore options for the relocation of the existing house at the esplanade to avoid, if possible, the demolition of the building." This was seconded by Cr Barry Lathey. Cr Pearce acknowledged that there was now some confusion over who was responsible for the house and that a statutory process was now in place following the approval of the demolition earlier in the meeting. The motion was carried unanimously but Cr Shaw expressed doubt that the suggestion would be carried out in time to avoid demolition. Following up her earlier questions about the process followed in nominating Willow Court for national heritage listing, Cr Salt asked what had been done to implement the recommendations of the business plan developed by consultant Malcolm MacDonald at a cost of about $80,000. The mayor responded that the council had established and worked with the Willow Court Conservation headed by David Llewellyn, which had done as much as it could with the money available. This had led in part to Bronte House now being occupied by the Agrarian Kitchen Eatery. There had been no further implementation of the business plan although there had been funding applications to implement various components of the plan which were ultimately unsuccessful. Cr Salt then asked what the council had done with the fundraising plan developed by the Willow Court Conservation Committee. Cr Evans said the plan required funding and as he had previously said, funding had not been forthcoming. Cr Triffett asked what needed to be done to enable two students people from the municipality to attend a Youth Local Government Conference in October. The deputy mayor said he had attended a meeting on the subject and had been told the cost was considerable, in the tens of thousands of dollars. The mayor said he would seek a firm costing. Cr Belcher asked if the council could remove tyres that had been dumped near the Lyell Hwy overtaking lanes. The mayor and general manager said as it was a state road the Department of State Growth would be notified of the problem. Cr Belcher also spoke of the long delay in widening Tarrants Rd at Granton as promised, and asked how much property had to be acquired in order for this to happen. The mayor took the question on notice. Cr Lathey asked about a steel grate missing from a footpath in Dean St and Cr Salt mentioned a similar problem in Humphrey St.
Cr Shaw said several new staff positions had been funded in the council budget for the coming year and he asked for a timeline on when the positions would be filled, "and can it be sooner rather than later." Cr Evans said it should be possible to have the positions filled during August. Cr Shaw said he hoped the new positions, which have not been made public, would help to address his concerns about the standard of advice being provided to councillors. Cr James Graham said he had heard statements that night about the life of the tip. "Do we as a council have a document saying that the EPA has said that the life of the tip can be extended to 10 years? Where did that information come from?" Cr Evans took the question on notice, but after prompting from the deputy mayor, said some information had been provided at a workshop. In relation to the quarterly reports being provided to the Director of Local Government on the council's progress in implementing his requirements and recommendations following his review of the council last year, Cr Graham asked whether the director had ever replied with feedback. "The answer is no," the mayor replied. Cr Graham then asked about the feedback provided to members of the public who made submissions in the council budget process. Mr Winton said written acknowledgements would be sent but this did not included details of why submissions were successful or unsuccessful. In a break with tradition, the mayor then put a question to the general manager, asking what would happen if the council was to write to the state heritage minister and the Tasmanian Heritage Council, asking for Willow Court to be removed from the Tasmanian Heritage Register to enable unhindered development of the site. Mr Winton said the council had drafted a letter to the state and federal ministers seeking a meeting to discuss future arrangements with Willow Court and the mayor's query could be raised there. At about 8.20pm the mayor closed the meeting to the public and declared a 10-minute recess, noting that the closed meeting would resume at 8.32pm. Cr Belcher had previously announced that he would be an apology for the closed meeting. Minutes of the last Closed Meeting: Confirmed. Draft Minutes of Derwent Valley Council Audit Panel: Noted. Minutes of Special Committees of Council – Tidy Towns: Noted, and the general manager was authorised to discuss matters with the committee. General Manager Quarterly Performance Update: Noted. Closed Senior Management Report: Noted.